Health Costs > How Much Does Acupuncture Cost? According to the Mayo Clinic, acupuncture is defined as “the insertion of extremely thin needles in your skin at strategic points on your body.” The purpose of this is to “stimulate nerves, muscles and connective tissue. This stimulation appears to boost the activity of your body’s natural painkillers and increase blood flow.” While some people participate in acupuncture as a strictly mental process, “balancing the flow of energy or life force”, other people believe that acupuncture can actually help you physically and can have medical advantages. A normal visit for acupuncture will cost between $60-$120, according to acufinder.com. This cost will be on the higher side for the initial visit since a complete medical history and physical exam must be completed. The average acupuncture cost for a routine acupuncture session is about $75. Some insurance companies cover the cost of acupuncture while others do not. Some companies will only cover it if you have a note from a physician recommending it or if the acupuncture takes place at a physician’s office. The cost will depend on the type of therapy needed, the number of sessions and professional you use. For example, an acupuncturist located in Los Angeles charges $125 for the first session, and the cost of acupuncture for subsequent sessions is $80. UCSanDiego says acupuncture may be covered by health insurance, but if you’re not, its clinic charges $124 per session. The initial visit will include a medical history and physical exam. The initial visit will usually last the longest compared to the visits that come afterward. The acupuncturist will meet with you to discuss what exactly you hope to accomplish or heal by receiving acupuncture treatment. The actual acupuncture session will take about 30 to 40 minutes. Before the procedure begins, the acupuncturist will ask some health-related questions. This will give he or she a better understanding of your past. They will want to inquire about things regarding your diet, emotions, sleep cycle and more. After this exam has been finished, they will start the process. 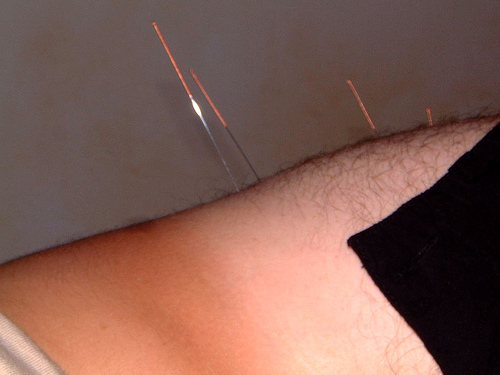 During the procedure, the acupuncturist will use anywhere from 6 to 15 needles. These needles will be inserted in a precise placement. While no pain is generally felt, you’ll find that you can feel a slight pain or prick type sensation. The needles are inserted about 1/16 to a few inches deep, depending on the location. These procedures can last up to one hour. The number of sessions you need will depend on the person. Some people will see great results during the first, while others, who have chronic conditions, may need multiple sessions in a month to see desirable results. A small percentage of people have reported some pain and discomfort after acupuncture; some of these have required therapy to repair any damage caused. This is usually only the case when the acupuncture is administered incorrectly. Depending on who is visited, some practitioners will recommend Chinese herbs. These herbs, such as ginseng can help by treating ailments on top of the acupuncture procedure. While optional, some patients will provide a tip to their acupuncturist. While most do accept them, it’s best to give 10 to 20 percent of the initial fee. The acupuncturist will apply glass cups to create a suction on the skin. Once the suction has been applied, this will help relieve stagnation. Providing an electrical stimulation, an acupuncturist will use two to four needles to treat the area. Herbs in the form of teas and pills can help supplement the treatment after it has been done. A “Japanese-style” acupuncture will use the same points as traditional Chinese acupuncture, but it typically uses thinner needles. This technique will focus more on using the hands. This type is commonly used for those who are fighting some sort of addiction such as drugs and alcohol. Common conditions that are treated with acupuncture include things such as the common cold, arthritis, cramps, lower back pain, asthma, weight loss, sinus problems, headaches and more. Acupuncture is a great way to help kick the smoking habit to the curb. For those who currently struggle with smoking may want to give something such as acupuncture a shot. Acupuncture is going to release pain-relieving endorphins. Upon inserting these needles, acupuncture is going to stimulate circulation, as well as influence electrical currents throughout the body. 99 percent of the time, health insurance providers won’t cover a procedure such as this. While it doesn’t hurt to ask, most insurance companies don’t deem it medically necessary. If you take any sort of prescription medicine, always be sure to let them know. Are you NCCAOM certified? Make sure that the acupuncturist is certified by the national board. This will ensure that he/she has passed the state exam. How many years have you had your practice? How many people have you worked with? Are you licensed through the health state department? How many hours am I going to be here? Do you accept insurance coverage? Because acupuncture treatment usually takes multiple sessions, scheduling all appointments up front can usually save you money. If you do plan on going to have acupuncture done more than once, you may want to consider purchasing the services in a package. These packages can include help for smokers or even those looking to lose weight. Going to a chiropractor or physician that offers acupuncture is usually cheaper than going to someone who specializes in acupuncture only. These books may also help you with how the process works, as well as what you can expect with the process. Check around your area to see if there are community centers that provide discounts to those who meet certain income requirements. If certain income is met, the center may be able to provide a 30-minute session for less than $30. My Acupuncturist charged my PIP insurance $650/session and now she wants me to pay that which is left owed after she exhausted my benefits. Found a local place that charges about $125 for 45 minutes. This is without insurance.